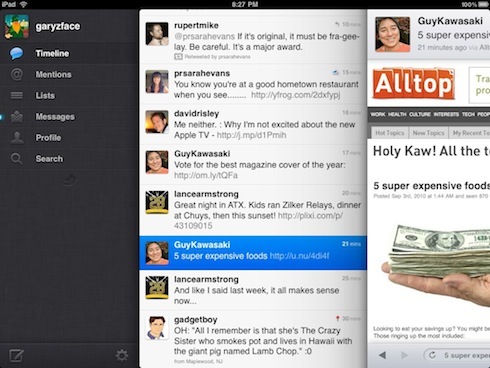 There are a lot of options when it comes to a Twitter app for the iPad. Everyone of them does something good and leaves other areas untouched. Depending on how you interact with Twitter, you will find your choice of a solution will be different from others in the room. For our office, it is just that way. There are those of us that just need updated information from a couple sources, others are trying to post our company messages, and still others need to see trends. Earlier this year, Twitter announced they bought a app from the developer and was going to be releasing an highly updated version with their name on it. 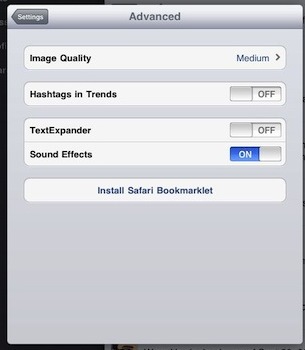 And, that is what they did, highly updated and tuned for the iPad! Upon launching the free Twitter app, you will notice that you do not need a Twitter account to see what is in the public stream. 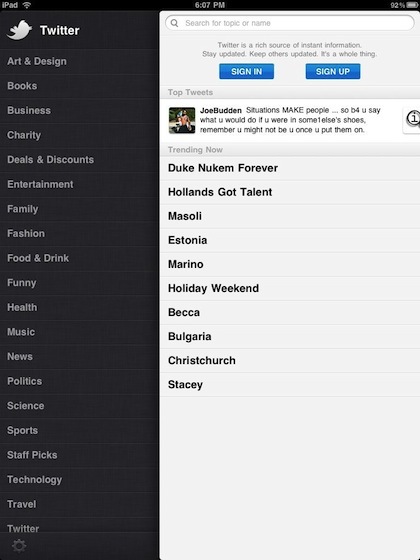 You could just enjoy what is trending and flowing from everyone without ever logging into Twitter. 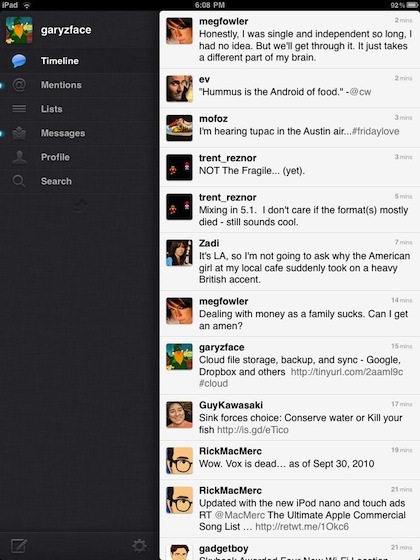 Once signed in, you have the latest tweets from who you are following appear in the Timeline option. 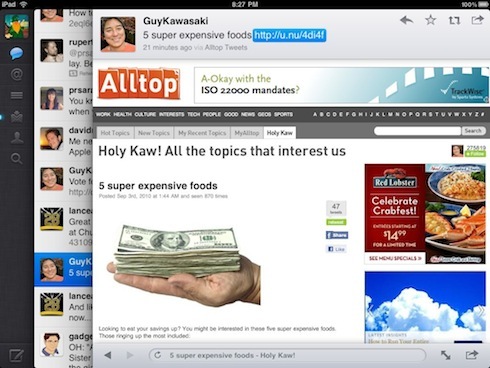 You also have access from buttons on the left to view Mentions, Lists, Messages, Profile and do a Search. 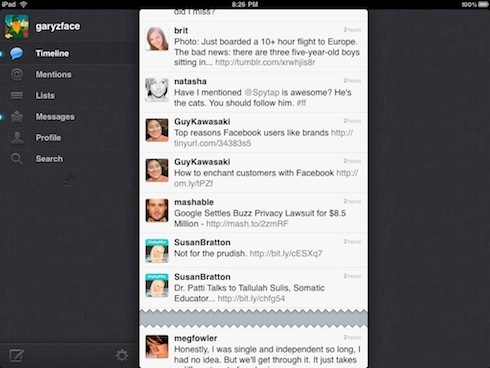 The universal Twitter app works equally well in portrait or landscape view as well on the iPad and iPhone. Here you can see a ‘paper cut’ graphic in the list which is a marker to show the point between two refreshes on viewing tweets. Most apps you have to read through the list, looking at times to see what was new vs what you looked at the last time you launched the app. 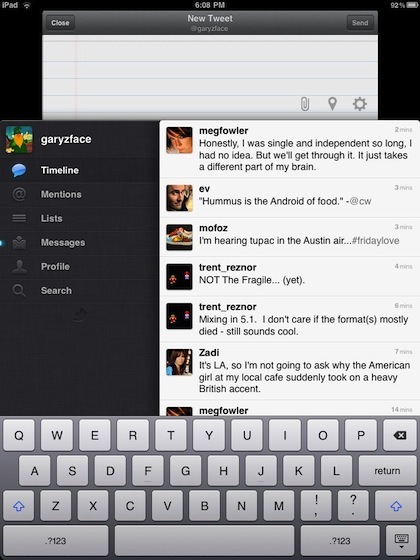 Tapping the writing graphic in the lower left corner brings up a new tweet writing area. You can also pinpoint a location your at, add a photo and shorten a URL you have in your post. 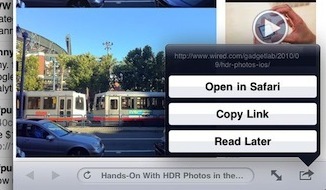 The link opens in a new overlapping window entering from the right. 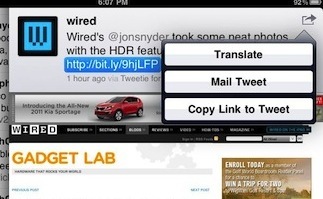 The lower right corner ‘share’ option also has the ‘copy link’ option, but adds the ability to open the link from the tweet in the iPad’s Web browser or send to your Read Later account. 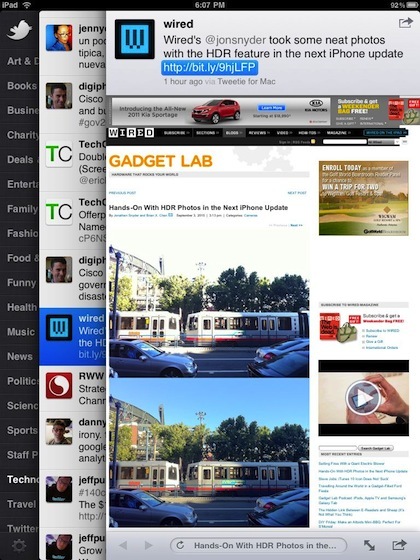 In landscape view, the link opens an overlapping window like in the portrait view. Adding additional feature buttons in the upper corner to reply to the person that posted the link, star as a favorite as well to retweet or quote the tweet. Very handy for those of us that sweep a lot of posts and need to share the info we find quickly! You can slide the Web page to the right so you can see your Twitter feed and sweep through it for anything you need to get updated on. Then pull the Web page back over to continue reading it. When you sweep up/down the list, the post with the Web page link in it stays blue and rests at the top or bottom of the screen depending on which way your sweeping. Twitter seems to have learned from the many options on the market with the features we needed and making them easy to get to. 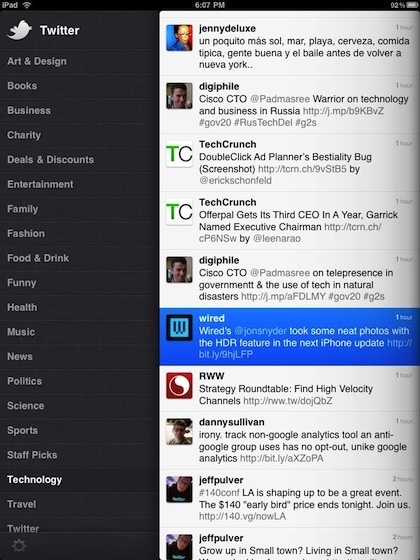 Very nice for a Free Twitter app.